Through these tough economic times, many businesses have to make some tough decisions about the way they run their business. Many look to save costs and avoid unnecessary expenses. Others look to invest in latest technologies to improve productivity and efficiency. After many years of economic stability, Greece suffered in the hands of recession in recent years. Many businesses diluted due to this economic downturn. However, one family business in Greece decided to ride out the recession and invest in the latest software technology which has undoubtedly bought them success and business growth through difficult trading times, demands to satisfy challenging lead times and cope with rising steel prices. K. Liaromatis S.A, set up by Mr Kostas Liaromatis, President and Managing Director, in 1974, has instilled core values in the business to represent the key beliefs of his family. They symbolise integrity and honesty, which is the way Liaromatis do business with both clients and suppliers. 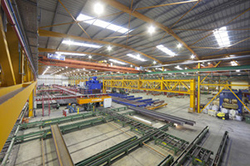 K. Liaromatis S.A chose STRUMIS in 2004 as their preferred steelwork fabrication management information system. Due to dedication and commitment to the latest software innovations in the steelwork industry, K. Liaromatis S.A. invested in the latest fabrication technology in CNC machines and Material Requirements Planning Systems – STRUMIS, to expand their family business. 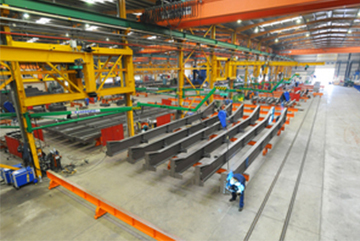 STRUMIS software solution provides steel fabricators with the increase in productivity, reduction in material wastage, improvement in efficiencies and required traceability to facilitate improved competitiveness and ultimately become more profitable. STRUMIS - steel fabrication management software is for engineering and fabrication companies who are looking to implement a dedicated fabrication management information system to benefit from BIM and provides built-in processes aligned to steel fabrication unlike generic ERP/MRP systems. Mr. Steve Watson, STRUMIS’ Sales Manager commented, "I’m extremely impressed how K. Liaromatis S.A. have expanded since I was there training their staff many, many years ago. We are extremely proud that K. Liaromatis S.A. have fully implemented STRUMIS in their business. K. Liaromatis S.A. is a practical thinking, hands-on organization who is committed to excellence and quality via the latest software innovations; this is an example of how the investment made with a complete production control system as that provided by the STRUMIS system for structural steelwork fabrication has allowed business growth through the tough economic climate." Deir ALI II – Combined Cycle Power Plant, SYRIA. The project refers to the fabrication of the steel structure and erection of the main Steam Turbine Building for the new Combined Cycle Power Plant (CCPP) in Deir Ali, Syria. Turbine Building - Combined Cycle Power Plant, Greece. The project refers to the fabrication of the steel structure and erection of the main Turbine Building for the new Combined Cycle Power Plant (CCPP) in Agioi Theodoroi, Korinthos, Greece. Click here to see other projects from K. Liaromatis S.A.
K. Liaromatis S.A. commits to provide excellence and value in our structural solutions. Our dedicated approach delivers exceptional quality, predictable outcomes, continuous growth, opportunities, and mutually beneficial relationships. Our vision is founded on quality and "adding value" to the construction process. This vision encompasses the tradition of superior construction practices, with an emphasis on innovation. Integral to the concept of quality is our adherence to the highest ethical and professional standards, a hallmark of our industry leadership.